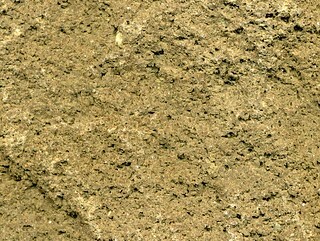 Wyomingite (= peralkaline ultrapotassic lamproite) from the Pleistocene of Wyoming, USA (field of view ~8.8 cm across). Southwestern Wyoming's Leucite Hills are a group of Pliocene to Pleistocene volcanic centers that erupted lamproite lavas, a rare extrusive igneous lithology. Based on chemistry and mineral content, the Leucite Hills lamproite lavas have been categorized as wyomingite, orendite, or madupite. Volcanism in this area may possibly be due to Yellowstone Hotspot fringe melting of the mantle. The lamproites appear to be derived from lherzolite-harzburgite mantle rocks that were metasomatically enriched in phlogopitic veins at >1.2 Ga (the latter may be caused by Precambrian subduction along the Wyoming Craton margin). The sample shown here is a wyomingite, the "official" state rock of Wyoming. 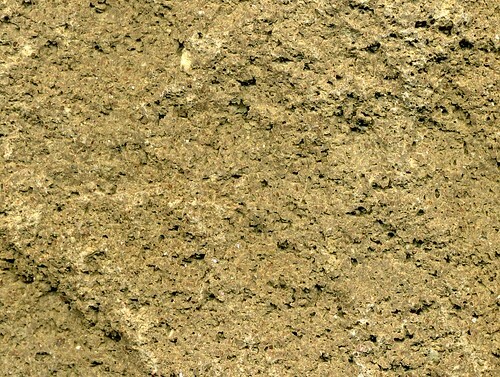 A "better" lithologic name might be peralkaline ultrapotassic lamproite (a.k.a. diopside-leucite-phlogopite lamproite). The principal minerals are reported to be leucite, diopside pyroxene, phlogopite mica, fluorapatite, and katophorite. The wyomingite was erupted as a lava flow onto Zirkel Mesa, which is part of the Leucite Hills Volcanic Province. Location: open-pit mine in the Pumice Hills, Zirkel Mesa, Leucite Hills, northeast of the town of Superior, north-central Sweetwater County, southwestern Wyoming, USA (~41° 47’ 53” North, 108° 54’ 54” West). Lange, R.A., I.S.E. Carmichael & C.M. Hall. 2000. 40Ar/39Ar chronology of the Leucite Hills, Wyoming: eruption rates, erosion rates, and an evolving temperature structure of the underlying mantle. Earth and Planetary Science Letters 174: 329-340. Schultz, A.R. & W. Cross. 1912. Potash-bearing rocks of the Leucite Hills, Sweetwater County, Wyoming. United States Geological Survey Bulletin 512. 39 pp.